I learned a new word a few months ago – bayou. Well I had heard it years ago in a Roy Orbison song, and I now know its meaning. It is the slow moving part of a river left when a meandering river breaks through, diverting the main flow. It can be large or small, swampy, marshy, with or without a clearly defined shoreline. 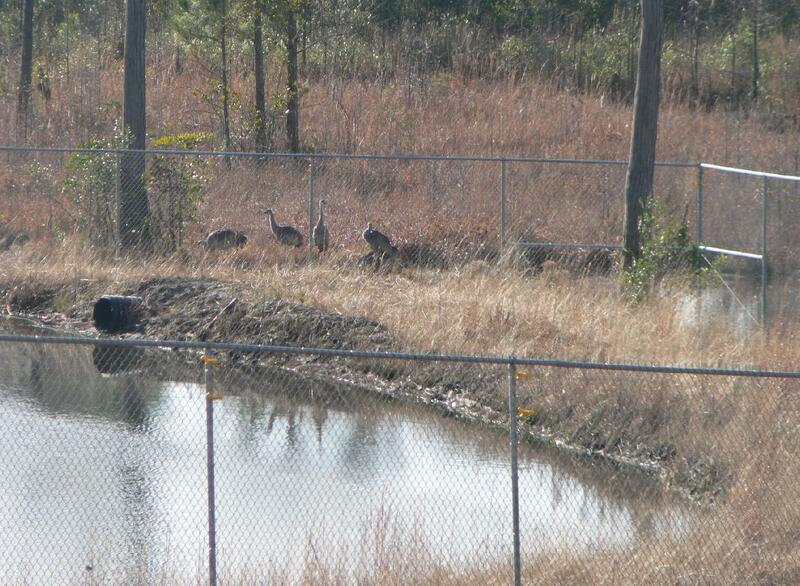 It is a Native American Muskogean word used in the south east of USA, where there are lots of low-lying wetlands. It was coupled with the word savanna, which is a sparsely treed grassy plain, in this area with acidic water-logged soils, and perhaps three or four pine trees per hectare. In the 1970s the Interstate-10 highway was pushed though from California to Florida, through an extensive wetland region east of New Orleans, west of Mobile. 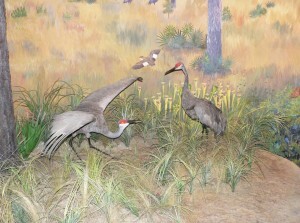 It cut in two the natural habitat of a very rare bird, the Mississippi Sandhill Crane, then with a population of less than thirty. One man, Jake Valentine, activated the move to protect this bird, including a court case to stop the highway construction. It has a population now of about 110, through the good work of the US Fish and Wildlife Service. I visited the 77 square kilometre (about the size of Wellington Harbour) National Wildlife Refuge and saw several of the large birds, some grazing on pasture, and some detained near a small lake with a fence round it. These latter were young birds, hatched and reared offsite, with brailed wings so they cannot fly. The restraints are removed after several months of socialising with others of their species. There was a blind (hide or maimai) close by for observation. They are beautiful birds, well over a metre high, with long thin legs, big wings, a large grey body, long neck and red top-knot. They mate for life, and number around 25 breeding pairs, with 18 known nests this season. 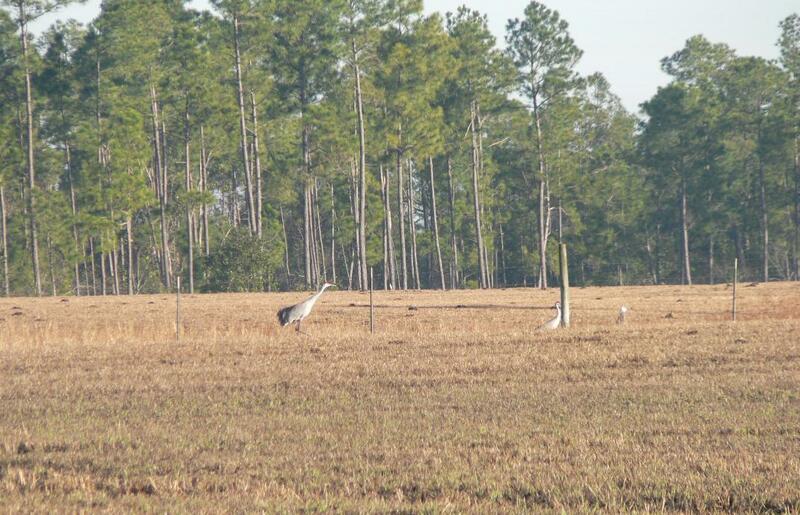 They stay around their habitat, not socialising or breeding with any of the migrating cranes that pass through the region. There are many bird varieties in the refuge, including duck, scaup, shoveler, killdeer, sparrow, robin and warbler. There are vultures, hawks and kestrels, as well as mammalian predators. When I was there, there was a question about what a dog was eating in the long grass, in the same farm paddock as several sandhill cranes. The grasslands are biologically very diverse, with plants that can survive on the poor, acid, wet soils. Some have nutrient augmentation by being carnivorous: butterworts, sundews, bladderworts and pitcher plants. Others are orchids, violets, peas, candyroots and colicroots, and larger saw palmetto, holly, blueberry and huckleberry. 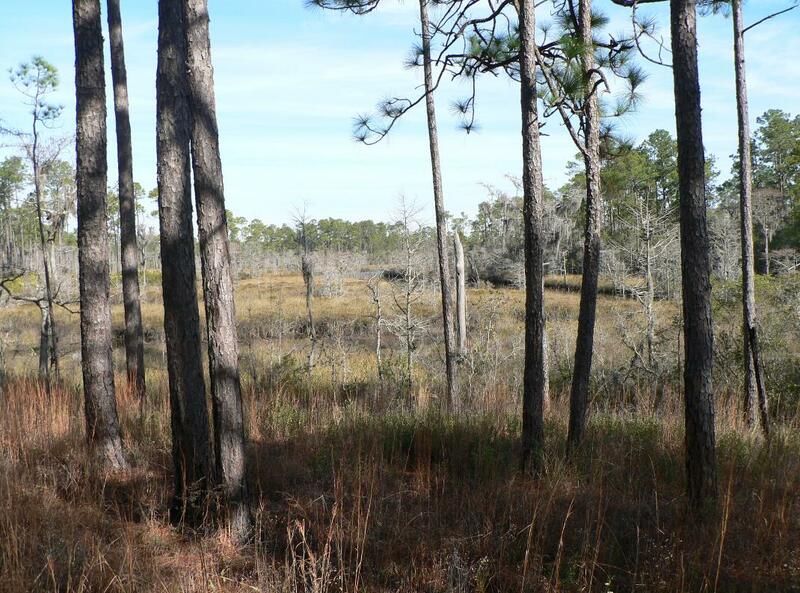 There are several varieties of trees: predominately longleaf pine, but some cypress, live oak, tupelo, maple, bay and the introduced slash pine. 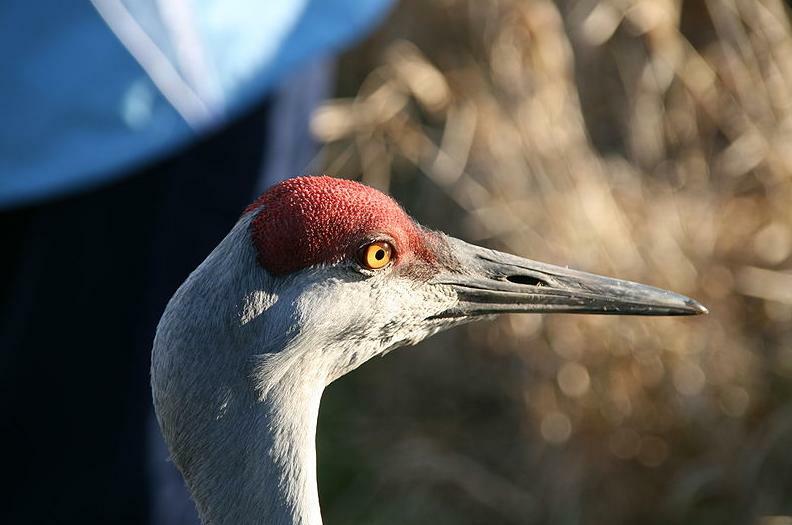 Some of the previously drained forested areas are being cut down and converted to better crane habitats with much less canopy, as only a few percent of their original habitat survives. Fire is used to control the rank growth, that adds ash to the soil, opens up the pasture, yet does not harm the pines, because they have extra thick non-flammable bark. Wire grass depends on fire – it does not seed until after a burn. Currently they are keeping a watch on the Gulf of Mexico oil spill, and have no immediate fears for the birds. One of the advantages of the Gulf is that it has a negligible tide, with limited daily seawater ingress into the wetlands. The big worry is hurricanes, that generate storm surges that travel perhaps ten or twenty km inland. This could instantly devastate thousands of square km of fragile coastal wetland environments.